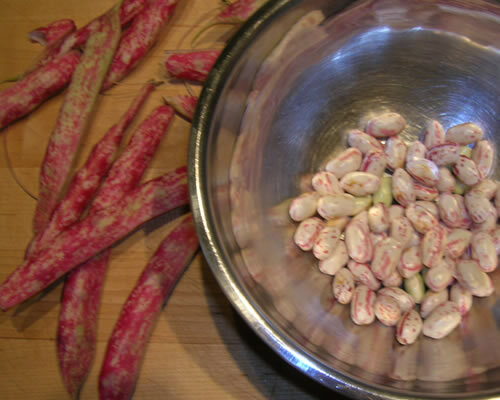 On my Monday Gentile’s run, I found the first of the end-of-summer cranberry beans. Creamy and nutty, they’re good on their own, or mixed in as an ingredient with other things. Tonight, they played a supporting role. 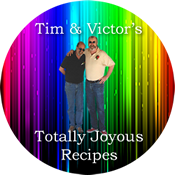 I found one recipe that had a lot of what I was looking for, but a lot more than I wanted. Clams and pork are a classic Portuguese combination. The briny sweetness of the bivalves and a tomato sauce studded with zesty chorizo bring out the richness of the chops. Cut 1/4 inch off tops of garlic heads and put heads, cut sides up, on a sheet of foil. Drizzle with 1 tablespoon olive oil and wrap tightly in foil, then roast in oven until garlic is soft when pierced with tip of a knife, about 45 minutes. While garlic roasts, heat remaining 1/4 cup olive oil in a 3- to 4-quart heavy pot over moderately high heat until hot but not smoking. Add bay leaves and cook, stirring, until leaves begin to brown, about 10 seconds. Reduce heat to moderate, then add onion, carrot, celery, and chorizo and cook, stirring occasionally, 2 minutes. 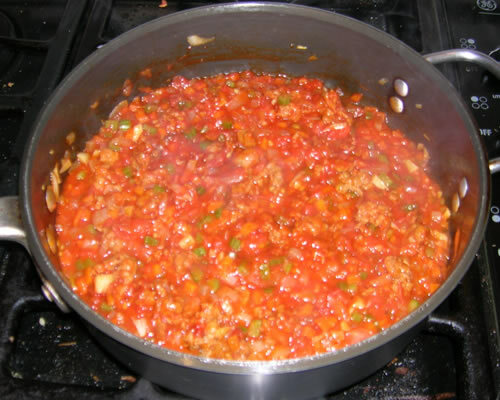 Add tomatoes, tomato paste, cloves, red-pepper flakes, and black pepper and cook, stirring occasionally, until vegetables are softened, 6 to 8 minutes. Add wine and bring to a boil, then add broth and reserved clam juice. Simmer, uncovered, until reduced to about 2 cups, about 15 minutes. While tomato sauce simmers, squeeze pulp from garlic cloves and force through a medium-mesh sieve into a bowl using a rubber spatula, discarding solids. Whisk purée into tomato sauce. Discard bay leaves and cloves, then keep sauce warm while grilling chops. Prepare grill for cooking. If using a charcoal grill, open vents on bottom of grill, then light charcoal. Charcoal fire is medium-hot when you can hold your hand 5 inches above grill rack for 3 to 4 seconds. If using a gas grill, preheat burners on high, covered, 10 minutes, then reduce heat to moderate. Pat pork chops dry and sprinkle on both sides with salt. Grill pork chops on lightly oiled grill rack, covered only if using a gas grill, turning over once, until thermometer inserted 2 inches into center of a chop (do not touch bone) registers 145°F, 12 to 14 minutes total. Transfer chops to a plate and keep warm, loosely covered with foil. Add clams to sauce and cook just until clams plump and edges begin to curl, 30 to 45 seconds. Stir parsley into sauce along with any meat juices accumulated on plate. Serve chops topped with clams and sauce. If you aren’t able to grill outdoors, chops can be grilled in a hot, lightly oiled, well-seasoned ridged grill pan over moderately high heat. I didn’t want the clams, my pork chops were thin and boneless, I didn’t want to spend 45 minutes roasting garlic, and I wanted to use the cranberry beans… It was a perfect recipe – to remake. Heat oil in skillet. Add bay leaves, then garlic, onion, celery, carrot, and chorizo. Cook until sausage is done and vegetables tender. Add tomatoes and tomato paste. Cook a few minutes then add remaining ingredients. Bring to a boil and then simmer about 15 minutes. I cooked up a bit of Israeli Couscous to serve with it. 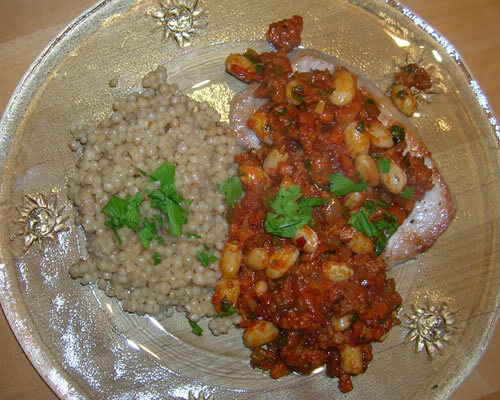 The pork chops – thin and boneless as I stated above – were pan-fried in a dry skillet for just a few minutes. It was really flavorful – and took minutes compared to the hour and a half for the original recipe!